The excellent moisturizing and skin repairing benefits of provitamin B5, which is also called Panthenol, are very important for any daily skin care regimen for every skin type and age. So, let´s have a look at some useful information about this ingredient as well as the way you can get advantage of pro-vitamin B5 benefits for skin. Provitamin B5, also known as dexpanthenol or panthenol, is a precursor of pantothenic acid, a water-soluble B complex vitamin which plays a vital role in the metabolism of carbohydrates, fats and amino acids. What is the Difference between Vitamins and Pro-Vitamin B5? Vitamins are organic compounds and although they are produced in our body, they are also found in foods and play an important role in the normal development and function of the body. Provitamin b5 is of a lower molecular weight compared to vitamins but once it enters the body, it converts into vitamin. What Does Provitamin B5 Do For Skin? It is an effective hygroscopic agent that has the property of binding water and retaining it by feeding the skin. At the same time, when pro vitamin B5 is applied to the skin, it forms a protective film on the surface to prevent transdermal loss of moisture. The more hydrated the skin is and the stronger the protective skin barrier is, the more resistant it is over time to damage or skin aging. More specifically, pro vitamin b5 has strong moisturizing properties. It is a well known fact that water is necessary for the life of every living cell and the same goes for skin. When the cells are healthy, they contain 70% of water. However, daily exposure of the epidermis to negative exogenous factors disrupts the hydrolipidic film of the surface of the skin, thereby evaporating the water that exists in the lower layers. The visible effect of this to our skin is rough texture, dullness and even itchiness. The pro vitamin B5 that is found in cosmetic creams stands out for its instant absorption to the deeper layers and the effective moisturization it offers to the skin. It is also good at rejuvenating dry skin, making it smooth and feeling more refreshed. Another benefit of provitamin b5 is its ability to heal, protect and replenish damaged skin or skin that is vulnerable to skin deteriorating factors. Let me explain a bit more. What we see and touch daily is the upper layer of our skin, the keratin and epidermal barrier, our skin´s protective barrier from the outside world. It is a mixture of keratinocytes, lipids and sebum which prevents the penetration of bacteria or allergens as well as the evaporation of water in our skin. 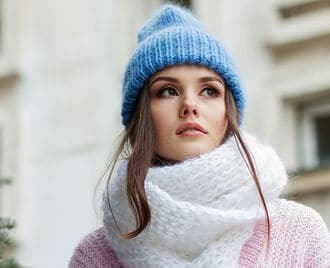 Other factors that negatively affect the skin´s protective barrier is sun damage, environmental pollution, aging as well as daily skin care habits which affect the skin negatively such as the use of harsh cleansers and exfoliators or products that are just not suitable let alone beneficial for our skin type or condition. Dry rough skin and hypersensitivity can make things even worse. At a young age, the natural repair mechanisms of the skin quickly repair skin damage, but as we age and because of the accumulating effects of all those factors that affect the skin negatively, those natural mechanisms tend to weaken. Pro-Vitamin B5 has proven to be able to repair and strengthen the skin’s protective barrier when it is weakened, restoring the balance to the epidermis. 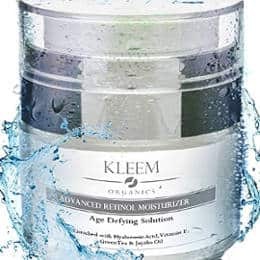 If you are looking for an anti aging moisturizer that contains provitamin b5, this day and night cream by Kleem Organics is a very good option since it contains natural and organic ingredients including effective anti-aging components. More specifically the key active ingredients are 2.5% Retinol, Hyaluronic Acid, vitamin E, green tea and jojoba oil. Panthenol is listed towards the end of the list of ingredients, and other good components include aloe vera, phospholipids and shea butter. This product can be used both on the face and eyes area and is suitable for both men and women. The company promises results in five weeks. They also claim it is suitable for sensitive skin and recommend it even for women 25+. Nevertheless, if you want a moisturizer that contains a higher amount of provitamin B5, I would suggest that you have a look at the next options in this review. If you want to benefit from the skin restoring benefits of Panthenol for dry skin, this DML Forte Cream is said to be super moisturizing and suitable for all dry areas on the hands, face and body. It also claims to provide prolonged relief in cases of severe dry chapped and cracked skin and is also indicated for cases that the skin is irritated. It is fragrance free, non-comedogenic and hypoallergenic as well. Users review very positively this product when it comes to healing and restoring very dry, bleeding and itchy skin effectively as well as skin irritation caused by severe cold. They prefer to use it in the winter due to its thick texture and the protection it provides against extreme weather conditions. One more advantage people mention is that although it is thick in texture, it soaks into the skin fast without feeling oily or greasy and it does not clog pores or cause acne. It also has a mild scent that is not overpowering at all. This Cicaplast Baume B5 is recommended for dry skin issues of adults, children and even babies. It contains Panthenol, which soothes dry rough skin, Glycerin and Shea Butter, which are skin nourishing and fight dryness and irritation, as well as Copper, Zinc, Maganese and Madecassoside that are good for dry and irritated skin. This rich product is non-oily or sticky and is free of parabens, fragrance and Lanolin. It can be used on face, hands and body, and is deeply moisturizing. You can also use it on the lips as it is a balm and has a matte finish. Users like that it calms down their irritated skin or dry chapped lips and the fact that it is not heavy, it absorbs well and is odorless. 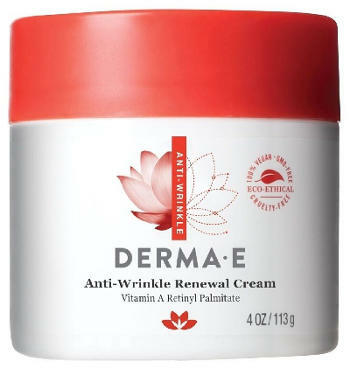 This DERMA E Anti-Wrinkle Renewal Cream is basically an anti-aging cream that also contains panthenol but panthenol is not its main ingredient. Its main benefits, according to the company claims, are diminishing wrinkles and fine lines, as well as making the skin supple, soft and smooth but it also helps with rough skin, texture and skin dullness. This product is free of parabens, sulfates, mineral oil, Lanolin and gluten. Apart from panthenol, good skin care ingredients that it contains include Retinyl Palmitate, vitamin E, avocado oil and allantoin. 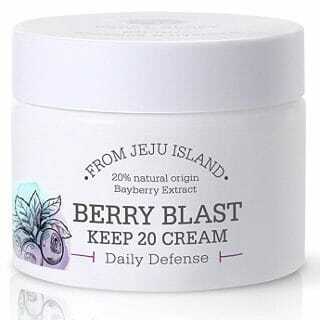 This Berry Blast Cream claims to be a skin regenerating and moisturizing cream. It contains panthenol and collagen for moisture retention as well as 20% of bayberry extract that contains vitamin C to firm the skin and prevent aging. Another good ingredient is Niacinamide. Apart from bayberry, raspberry and acai berry also help tone the skin. Other ingredients it includes are said to lighten the skin and reduce discoloration. This is obviously not a cream with panthenol as a main ingredient to primarily target dry skin issues but if you want a face moisturizer that contains panthenol, this cream may suit your skin. Nevertheless, if you have sensitive skin, keep in mind that this product contains fragrance. All in all, pro vitamin b5 panthenol benefits for skin and especially dry irritated and chapped skin are unquestionable and very important when it comes to repairing skin and restoring its health as well as keeping it moisturized, soft and smooth.